As the storm made its way across the Atlantic and up the eastern seaboard, there was little warning. Radar had not been invented. The National Weather Bureau predicted it would blow itself out at North Carolina, but it didn't. No one had ever seen a storm like this. Rhode Island fishermen, residents and vacationers recount what it was like to live through one of the greatest natural disasters recorded in North America. In September of 1938, a great storm rose up on the coast of West Africa and began making its way across the Atlantic Ocean. 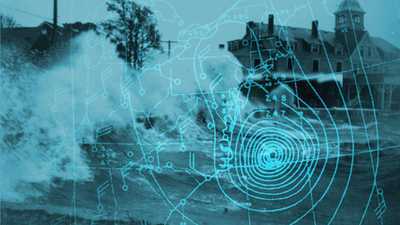 The National Weather Bureau learned about it from merchant ships at sea and predicted it would blow itself out at Cape Hatteras, North Carolina, as such storms usually did. The coastal forecast from New York to Maine called for "fresh southerly winds" with some cooler, rainy weather. Out on the eastern end of Long Island, fishermen set their lobster traps as usual and prepared for another tough winter. At wealthy summer homes in the Hamptons and in Newport, Rhode Island, families continued with plans to entertain their friends. But the storm didn't blow itself out at Cape Hatteras. 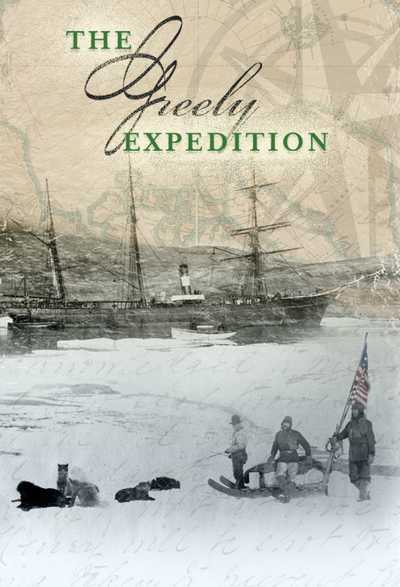 It suddenly began an unexpected sprint north along the coast, surprising even the Coast Guard. No one had ever seen a storm like this; radar had not yet been invented. Within 24 hours, the storm ripped into the New England shore with enough fury to set off seismographs in Sitka, Alaska. Traveling at a shocking 60 miles per hour — three times faster than most tropical storms — it was astonishingly swift and powerful, with peak wind gusts up to 186 mph. 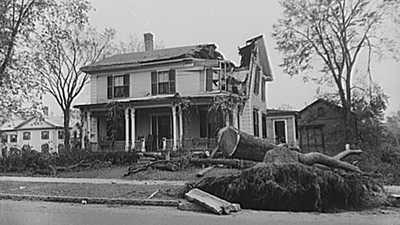 The storm without a name turned into one of the most devastating storms recorded in North America. Over 600 people were killed, most by drowning. Another hundred were never found. 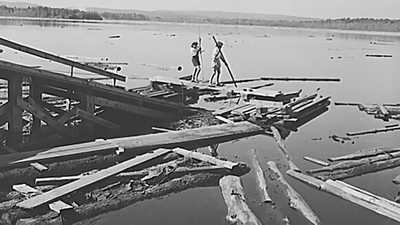 Property damage was estimated at $400 million — over 8,000 homes were destroyed, 6,000 boats wrecked or damaged. 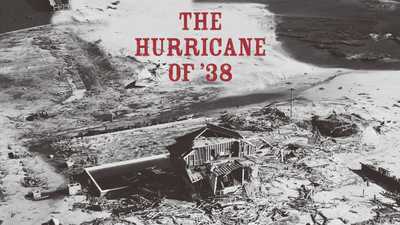 The Hurricane of '38 chronicles the lives of fishermen, residents and vacationers on the day before the storm, following their stories through one of the greatest natural disasters ever to befall the eastern seaboard. Sherman Grinberg Film Libraries, Inc.
Narrator: On September 4, 1938, a French meteorologist in the Sahara noted winds moving west toward the African coast and the Atlantic Ocean. Two weeks later, these winds -- now at hurricane force -- were seen again northeast of Puerto Rico. The Jacksonville office of the U.S. Weather Bureau broadcast hurricane warnings for southern Florida on the 19th of September, but by the next morning the hurricane had turned. Florida was spared. The storm was now headed north. Milton Miller: I was born to be a fisherman. I was born right on the beach in back of a sand dune there not over 300 or 400 feet from the ocean. And you know, I used to hang around and be down there when I was a little boy just to get -- well, we used to have to open bait and to bait these codfish lines. I'd probably make 25 cents a day, but 25 cents them days were a lot of money and the family needed it. Narrator: There was nothing unusual in the forecast, Wednesday September 21st -- fresh winds from the south, overcast, a chance of rain. Among the fisherman, the talk was of clams -- $2.50 a bushel, $5 for a hard day's work; not bad wages for the depression. There was no mention of the hurricane, now 60 miles off Virginia and moving north toward Long Island. Ed Ecker: The morning was kind of a mild day. Nobody talked about hurricane. Nobody even talked about a storm, and nobody heard that there was anything coming, not even the fisherman. Milton Miller: There's no such thing as weather reports, and you know, they'd stand around and say, "Well, Cap, what do you think the weather's going to be?" And he'd look around, maybe light up his pipe, looking around, sniffing around. "Well, you know, we might make it today. We'd better hurry. Maybe we'll only get a half a day in, but we better be back by noon." I think it was more instinct than anything else. Narrator: The village of Montauk projected out into the Atlantic at the eastern tip of Long Island. For its fisherman, the weather was an unending struggle. The summer months meant butterfish and porgies, also the chance of sudden squalls that could swamp their small boats and tear their traps. Come winter, the fisherman would row out before dawn, their cotton coats painted with fish oil to seal out the freezing wind. But this was September. Winds from the northwest eased the surf and gave the best fishing of the year. Milton Miller: During the summer, I fished the bay. By September, we'd go on the ocean and start hauling for striped bass. And when I say hauling, I mean that I -- we used a boat with a net, and this is the oldest type of fishing in history, to haul seine. Narrator: Each day, the men would cart their fish to the Promised Land dock, where it was loaded onto the train for New York's Fulton Street market. Children would give the engineer a codfish. In return, he'd lurch the train so that handfuls of precious coal would spill onto the tracks. That year, 1938, the WPA finally brought sewers to the eastern end of the island. It was also the year dial phones came to Montauk. The local paper complained of "curious buzzes and clicks." But the fisherman missed out on most of these modern miracles. They lived on the beach, in houses made from fishboxes and tarpaper, insulated with seaweed. Milton Miller: The night before the hurricane -- I'd been fishing all that night and that next day, yeah, I had sort of a sense. I knew by the weather it was getting bad. I mean, I knew a storm was coming over on the ocean side. We could see the sky is getting darker, the wind is breezing up stronger, so by the time I get to Promised Land, I see Captain Burt there, and he says, "Well, Milt," he says, "this barometer's falling so fast." He says, "We're going to get a blow somewheres." Plus they figure this was going to be a three-day northeaster. Ed Ecker: You know, we had northeasters and that type of thing. Never heard the word "hurricane." Never heard the word "hurricane" while I was running around, never heard the word "hurricane" in school. And I think I was in the third grade at that time, in 1938. The word "hurricane" was foreign to us. Patricia Shuttleworth: Every year, in June, we would pick up and pack the car and set off for Westhampton Beach from Newark, New Jersey, where we lived. It was always a cook and what we called a chambermaid-waitress. Over the weekend, we would go to the beach. At each side of the beach clubs were long ropes that went out to barrels, which floated out there, which showed you the limit of where you could swim. A lot of people would go and hang onto these ropes and as the waves broke over them, they would dip or bathe. Stuart Bartle: The ocean was really a big part of our life. We spent a tremendous amount of time in the ocean, going through the waves. The most fun we ever had was when it got rough. It was really important that we master the water. It was important to my stepfather, and it became very important to me. It was sort of becoming man. I guess I was -- I mean, I was a kid then, of course, and it was one of the things that made me a little better than the other kids, 'cause I couldn't run as fast as they could. You go with the flow, so to speak. You don't ever swim against the current. And the biggest thing you keep in the back of your mind is you're not going to be carried out to sea, you're going to be washed in. I grew up sort of foolishly fearless, I think, about the water. Narrator: When the residents of the Hamptons woke up to their newspapers that September 21st, the headlines were of Hitler and his threats against Czechoslovakia. Britain and France were caving in to Hitler's demands. Buried at the bottom of page 27, The New York Times ran a story about the relieved residents of South Florida. The paper praised the, quote, "admirably organized Weather Service" that had enabled New York and the rest of the world to have been so well informed. Patricia Shuttleworth: That morning was dark and gray. It was raining. People on the beach said later that they had been planning, for instance, to do some outdoor things that day. They decided to stay home and watch the surf. That was the reason they had bought and built on the beach, so that they could watch the ocean, and this was going to be a very exciting, rough day on the ocean. So this is what people were doing. Narrator: Servants were closing up the estates. Beds were stripped and covered with newspapers, summer clothes packed away in trunks. By mid-morning, there was already a furious wind. Near the beachfront, windowpanes blurred from the salt spray and sand scraped against the skin. Stuart Bartle: Around noon or maybe before noon, I went up to the dunes to look at the water, and I saw it was really fabulous. It was absolutely beautiful. As far as the eye could see, you could see these waves, I mean, white water going out as far as the eye could see. It was wonderful. It was a little scary, but you know, if you're a kid you can't imagine that anything bad is ever going to happen. Anne Moore: When you face something like that -- an impossible situation -- there is no way out. It's just not possible that you're going to survive this, and yet you do. You know, what will be will be. When your time comes, it comes and nothing can happen to you before it's time. Narrator: Anne and Cathy Moore lived with their family in Napatree Point, a community of 150 built on a sandbar at the southern tip of Rhode Island. A single narrow road ran from the mainland through Napatree Point down to the ruins of the old fort where children liked to play. Catherine Moore: We were in the bay, playing. We were allowed to go to the ocean side when someone went with us -- that was a big thrill -- and we played games in the water, of course. Anne Moore: You really want to get a sense of the swimsuit, woolen swimsuits which itched and scratched and -- and we were constantly chafed right through here on both -- it really hurt. I mean, it just did. Catherine Moore: As I recall, my mother -- they did laundry that morning because they hadn't been able to for the previous dull days. And it was nice, spanking wind and it would dry them, though I believe they did have to use clothespins and double-clip the laundry. I mean, it was that much wind. Narrator: The Rhode Island beachfront stood dangerously exposed. Houses were built on shifting sand, too close to the sea. Bridges were too flimsy, roads too low. Still, on mid-morning on the 21st, evacuation would have been possible -- if the Weather Bureau had put out the word. Anne Moore: Listening to news on the radio was not a part of our day as children, but of course, my father was always listening to the news, and we would pick up things, you know, from conversation. But as for any sort of storm warning, there wasn't any. There was none. Narrator: For days, this hurricane had been carefully tracked by the Weather Bureau in Washington, but with no sense of alarm. Its weathermen believed that hurricanes never hit New England. This storm, they were sure, would veer safely out to sea. At 10 A.M., as the skies darkened, the Bureau issued a standard warning for small boats to stay in port. 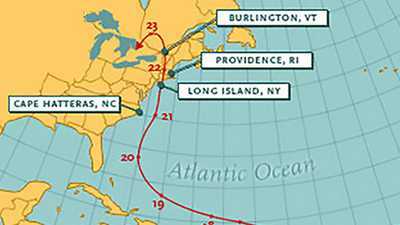 By then, the hurricane was off Delaware, just five hours from hitting land. Anne Moore: The sky -- that morning and before hurricanes in general, there's a dead feeling. The sky was an odd color. It was almost a yellowish color. It almost seems as if everybody in the world has died except you, you know. You don't hear birds. You don't really hear anything. It's an odd sensation. Narrator: On the morning of the 21st, the residents of Providence poured downtown on the nickel trolley. There was no notice given to the hurricane. The concern that day, like every other, was about weathering a different storm. Doris Layden: The Depression affected everybody. There wasn't one person in the City of Providence that wasn't affected by it. Margaret Deignan: And because you didn't have any money, you could go shopping, but it was only window-shopping. You dreamed. Narrator: In 1938, the WPA thought a family of four could get along on $25 a week. In Rhode Island, many people agreed. Many didn't have that much. For the young, Depression was the only life they knew, and there was only one place to escape and forget: downtown. Doris Layden: We forgot our troubles for a few hours, and then we'd go to Loews Theater and that was like going into fantasyland. From the ordinary life outside of sacrifice, you're coming into opulence. And wonderful carpets and the chandeliers and the curtains just transported you to another world. Marilyn Fogel Schlossberg: Downtown was the center of everything. There was such activity, such life and color downtown. It was Life with a capital L, and it was beautiful, beautiful at that time. Narrator: Long ago, much of Providence had been marshland, but in the 19th century, industrialists hungry for space had filled the swamps, spread the city all the way to the river's edge. City Hall, like other Providence landmarks, was built on wet clay, and during high tides water flooded the basements. On September 21st, the rivers were already swollen from four days of rain, and the ground was wet underfoot. Doris Layden: Well, the day dawned very nicely. There was sun. And then about 10 o'clock, it did cloud over. And we went to lunch and the girls at lunch said, "Let's go to a show." And down at the Metropolitan, Spencer Tracy was playing in My Son, My Son. And so we decided to all go after work. Well, come 2 o'clock, it did become very ominous. The clouds were just racing by. They weren't standing still, they were racing. Narrator: By 2 P.M., barometer readings were falling all along the coast. Winds climbed to 45 miles an hour, but there was still no official warning of the hurricane, now just two hours away, so people held to their plans. Marilyn Fogel Schlossberg: We were all gowned. Everybody was decked out -- mother and grandmother and myself, my dad and Joe. Everybody, you know, looked wonderful and very excited. Narrator: Joe Fogel and Loraine Martin had their wedding set for the 21st, downtown at the Narragansett Hotel. Joe's younger sister, Marilyn, stayed home from school and helped prepare. 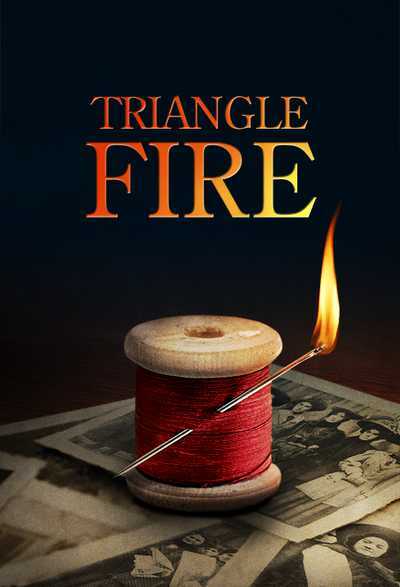 Marilyn Fogel Schlossberg: And then the winds were blowing and a lot of tree limbs, I remember, in the back of the house were swaying. And there was some growing concern, but my dad had a very positive attitude and everything was going to be fine and everyone should relax and there would be no problem. Loraine Fogel: I knew that the weather wasn't too good. And Miss Dyer from The Providence Journal-- and she was the society editor -- and she called me and she asked me if I was planning to go ahead with my wedding. And I said, oh yes, I was. It was a bad storm, but we're leaving soon. But after we arrived at the Narragansett Hotel, why it just kept getting worse and worse and worse. Narrator: The Weather Bureau could have predicted the hurricane. In fact, one forecaster did. More than 24 hours before it hit land, a junior weatherman mapped the storm's exact course. His chart was ignored. The warnings continued. An ocean liner sailed clear through the eye of the hurricane near Cape Hatteras and radioed back one of the lowest most dangerous barometric readings ever, but at the time there wasn't even a senior forecaster on duty. To the end, the bureau chiefs held to the belief that the hurricane would turn out to sea. Even in its last advisory after the hurricane was sighted off New Jersey, the Bureau warned only of gale-force winds. By then, anyway, it was too late. The storm was about to hit land. New York City caught the storm's western skirt, with 65-mile-an-hour winds. The East River flowed three blocks into Manhattan. Steam pipes under the streets burst from pressure. The Bronx went to blackout. Hospitals operated by candlelight. But this was the mild edge of the hurricane. In Long Island on the storm's eastern rim, winds slammed into the land at 100 miles per hour. The seismic impact registered as far away as Sitka, Alaska. Ed Ecker: I was in school. My mother sent a fellow named Marshall Prado up to pick us up. And I was sitting in the back, the car was swaying and that was the first inkling I had of any kind of problem or wind. When we got home, everybody was crowded in the dining room of the restaurant. The bar was open. There were fishermen in there, and everybody was talking about the storm then, because then, by that time, it was really whistling. And the next thing, I look out the window and the garage that we had the car in -- my aunt had just bought a 1938 woody Ford station wagon -- and the garage just picked up and went out into the bay, just demolished from the wind. Stuart Bartle: Just noise, tremendously noisy, and things are flying around, sand is flying around, leaves are flying around. Your hat's flying. You have to hold onto your clothes. You had to shout. Milton Miller: At first off, there was quite a few guys down there, but they was kind of getting shook up about that storm and first thing you know, they all left. And the only person I can remember was Captain Burt Edwards and myself down there. Narrator: When the hurricane hit, Milt Miller was at the Promised Land dock. 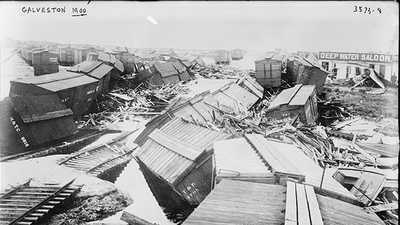 As wind gusts approached 120 miles an hour, steel shingles flew overhead and boats sprung from their moorings. Milton Miller: And I was really jumping from one boat to the other, getting the lines and throwing to Captain Burt. And Captain Burt, he'd be tying the lines, and then we'd run and get onboard of the big boats and the lines would be parting -- and that means breaking, you know -- and so we were so busy and we didn't even realize that we were in a hurricane or a storm like that. In fact, we didn't even realize the whole town was being tore apart. 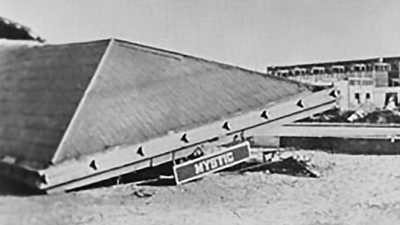 Ed Ecker: By that time, the fishboxes were airborne, and as we looked out the back, we could see the fishboxes landing in the bay and floating out. And meantime, the water is coming in, the tide was coming in and by the time we got really concerned, it was up to our back door. All of a sudden, this bay that I was swimming in all my life was right up in our house, and still moving. Narrator: The ocean turned a sickly yellow color. The wind yanked trees with all of their roots out of the ground and churned the leaves into a paste that turned the graceful white houses of Westhampton green. Then, suddenly, the wind died, the sun broke through and people emerged to assess the storm's toll. Patricia Shuttleworth: People all over the area thought the storm was over and came out. Then, of course, the wind shifted from the northeast -- which it had been blowing -- and to the southwest, and the eye passed over and then it began to blow twice as hard as it had before. Narrator: The eye of the hurricane brought calm for about 20 minutes. Then, as it moved away toward the Connecticut shore, Westhampton was hit a second time by the ring of winds just beyond the storm's eye, the fiercest part of the hurricane. Stuart Bartle: I looked out the window and a woman who was at the bottom of our driveway with the lights on her car on and she was coming up to our back door. And she said, "Haven't you heard the news?" She said, "The beach is being evacuated. You got to get out of here." Patricia Shuttleworth: About 3:30 or quarter of four, my brother came running into the house, saying, "The water's coming up, the water's coming up." And at that moment, they had to make, again, split-second decisions about what to do with all the people in the house. So they put as many people as they could into that little five-passenger Ford which they had. Mother drove. She put grandmother in and her guests, Father and the other children, but they couldn't fit the help in, so they said, "You'll just have to fend for yourselves." And she said she would never forget the sight of them standing there, waiting, when the water came up. Narrator: One hundred and thirty mile an hour winds pounded the sea against the dunes, never letting the tide recede. The surface of the ocean buckled and water, whipped by wind, crested into a dome 30 feet high. Servants left behind, owners trying to salvage their houses, spectators tricked by the lull -- these people now faced a surge of ocean water which swept across the barrier beach and poured inland. Stuart Bartle: Well, we got in the car, and there was tremendous mayhem. And that's when I, I looked out the front window and I saw this huge sea of water, like suddenly a lake was coming toward us. I guess it was that kind of feeling -- a lake coming toward us. And the next thing I know, the woman had stopped the car or maybe the water stopped the car. Anyway -- and the water came over the car and came right over the top of the car. And I remember thinking, "My God, we're under water." Patricia Shuttleworth: It was your worst nightmare coming true. I think many people have had through their years the nightmare of the ocean coming up and they're trying to get away from it and they can't get away from it. And this was something you're seeing right in front of your eyes. But everybody was trying to keep quiet and be brave when they thought every moment was their last. Narrator: There had been 179 houses in Westhampton Beach. After the storm surge, 153 had completely vanished. A woman pulled from the wreckage announced that Long Island was sinking. Anne Moore: Oh, it was exciting. I mean, from a 10-year-old's point of view, it was exciting, because boats were breaking loose and the wind. In fact, Cathy and I decided to go out, you know, to our favorite perch, but that didn't last long. Narrator: On Rhode Island's Napatree Point, the Moore family had heard no news about the hurricane. Telephone lines were down. The calamity on Long Island across the way was completely unknown. At first, the Moores responded as they would to any bad September storm. They searched for towels and bathmats to stuff in windows and began to mop up. Then the frame that held their dining room windows sprung out of the wall. Anne Moore: There was some discussion between my parents about whether or not we should evacuate, whether we should get out of there, and they thought yes, we should. So we piled into the car that was inside and -- but tried to open the garage doors and couldn't get them open. Catherine Moore: They had given up all hope of being able to drive away. There was no possibility of that. There was no road. And so we got out of the car. We headed for the stairs quickly. Anne Moore: The front door had burst in and there was water coming in there. And my father threw himself at that door to hold it. Catherine Moore: I remember looking at my father trying to hold a board against the front door, trying to hold the front door, and being quite sure, of course, that he could hold the ocean back, and then the horror of realizing that he couldn't. The original water, when we came home from school, was driven by wind and rain. But this was the ocean, this was the ocean coming, and when I think back on it, he was trying to hold back the ocean. Narrator: Jeffrey Moore was facing the hurricane at its peak strength. Winds that had spun for 10 days over the Atlantic, pulling in moisture and building power as they went, now threw their force onto the Rhode Island coast. The Moores' ground floor filled with water. Anne Moore: We rushed up the stairs, went into one of the bedrooms -- it happened to be my father's bedroom which was on the side toward the Nestor house -- and we could see their faces at the window. And they were kind of waving to us and we were waving to them. And finally, they apparently decided to try and make it to our house. Their house was beginning to go. Catherine Moore: We did know that the houses around us were going, but I remember looking out of the window and seeing the Nestors' house next door. And it was Ann Nestor who came out on the porch of the house. There was also a maid and another lady in that house and they were out on the porch. And a wave came and then they were gone. Anne Moore: It was a terrible feeling, but then we watched as the Nestor house essentially fell over. At that point, there was more than a sense that we were not going to make it. It was almost a certainty, almost an assumption that we were not going to make it. It didn't seem possible, with the houses being swept away. When it cleared a little bit, we could see that the houses beyond the Nestors' house had been swept away. And the water was rising. There was no way out of it that we could see. Catherine Moore: The house shimmied, as far as I recall, but it was rather like an elevator going down sideways -- a shift from one side to the other and a sinking, all of a sudden a sinking wow. And that was when the floor went out. Anne Moore: And then someone -- Daddy, I assume -- said, "Run for the third floor," and that was enough to knock you off your feet, you know. To go upstairs, you'd have to hang on the railing, and that was a big jolt. And then there we were, up on the third floor, under the roof. There was no place else to go. Narrator: The Moore house was the last one standing on Napatree point. Catherine and Jeffrey Moore, four children, Aunt May, two maids and a handyman were huddled in the maid's room when they felt the house shake free of its foundations. Catherine Moore: We all clung together on this piece of flooring, which served as a raft, strangely enough, and there was still some of the house attached to it. And next thing I knew, we were floating ­ we were on the water with the waves crashing over us, and part of the house still attached, one of the walls still attached to this piece of floor, and it almost acted as a sail. Anne Moore: In a case like that, you lose all sense of where you are, of direction. We assumed we were going out to sea. After all, we couldn't see anything. We couldn't see any land anywhere. Catherine Moore: I'm sure that there must have been just cold fear in the pit of their stomachs, but it didn't translate to us. I thought I was going to die. I can remember thinking I was going to die, and in those days, of course, that was followed by, "I'm going to Heaven." Beatrice Lowry Edmond: I guess we used to call Mom a "home Baptist" because she was always there at home Sunday noontimes to make dinner. And Dad and we two girls came to church and sang in the choir. So it was just part of our life. Narrator: As the hurricane reached Westerly, Rhode Island, the women of the Mothers Club of Christ Church were gathered at May Lowry's beachfront cottage for their first get-together of the season. Their picnic had been postponed twice, but that morning, at last, the weather was good. When May Lowry woke up, she prepared carrot-and-egg salad sandwiches for the picnic. She was busy and chose not to take Communion with the rest of the churchwomen that day. Jack Tobin: That morning, they would have been at home, making excited plans for the picnic luncheon and so forth that they were going to have, and they're all day at the beach. And then they came to church at 10 o'clock, and my father was the rector of the church and he did the service for them. And then, after that, they joyfully headed for Misquamicut and the beach and their picnic day. Narrator: Minister Tobin made the trip down to Lowry cottage to share lunch with the Mothers Club. These were the faithful women of his church. Nellie Poutray lived with her daughter, who supported them both working as a clerk at Var's Pharmacy. And there was Zalee Livingston. She lived with three generations of family. She sewed the clothes and curtains, scrubbed the floors, stole time for herself at the local library, reading until it closed. Ruth Friend cooked for the church, volunteered at the Masonic Lodge. The Reverend couldn't stay at the picnic. He had a funeral at church later that afternoon. Mrs. Livingston's grandson, four years old, was frightened by the noise of the surf, so the minister took the boy back with him. 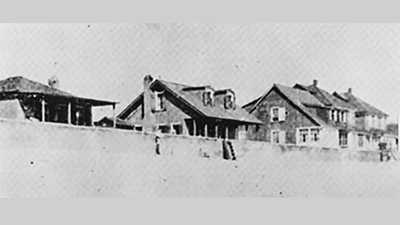 That left 10 women in May Lowry's cottage when the tide began to rise over the barrier beach. 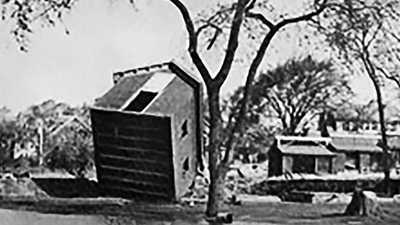 Beatrice Lowry Edmond: The wind was blowing so hard that she realized maybe that our house was not that secure, so they went over to this other house which was more strongly built. The lady who rented the house did get very frightened, so she said she was going to get in her car and leave and did any of these other women want to go with her? And they all said no, they were not afraid, and would wait the storm out. Jack Tobin: They were in the cottage with the wind blowing to the point where it was tearing the cottage apart. They moved to a larger cottage, but the same thing was happening there. The waves were knocking against the door of the house. It must have been a terribly fearful, dreadful thing -- caught, trapped out there. They had no place to go to escape this. Narrator: At 4:30 in the afternoon, the ocean surged across the Rhode Island beach. Along the short strip from Watch Hill to Point Judith, 118 people were killed, including the 10 women of Christ Church. Doris Layden: About 3 o'clock, the wind started. It sounded like a train coming through, like a whoosh, and it was the most awful sound you ever heard in your life. And we really were very frightened. I called home and my dad said he would be down to get me. I got into the car, my father¹s car, and we went up toward the cathedral. There was a furniture store there, and the whole glass came out in one unit and then went right up the street, shattering as it went. And the streets were popping. You could hear popping all over the place, and it was the windows coming out. And the city was being flooded and it came up with such force that there were actual waves in the center of Providence, and the trolley cars were just submerged. And when they were submerged, all these cars, the horns shorted, and the sound of the horns through the water was the most eerie thing you ever heard in your life. Narrator: The hurricane traveled up Narragansett Bay, hitting Providence at high tide. The bay acted as a funnel. The storm surge had nowhere to go but downtown. Waves inundated the sewers. Manhole covers burst open, and this land which was once marsh filled with water again, 14 feet at its highest point. Loraine Fogel: It was just gushing into all the small shops there on Weybosett Street. And the cars that were parked there were just going down Dorrance Street just like barrels, right into the Providence River. Narrator: Downtown Providence was transformed into a surreal junkyard. Uprooted houses from the neighboring community of Warwick, barrels of heating oil, great boulders from dockyards, sofas and chairs, hats and fur coats -- all washed into the city streets. People sought refuge wherever they could: the City Hall steps, the Biltmore Hotel, anywhere that was high and dry. For the first time in its history, the downtown Hope Club was forced to admit women. The old-timers complained fiercely. They said no good would come of it. Marilyn Fogel Schlossberg: My gosh, what a day to pick for a wedding, and you know, you plan and you plan and you plan, and then this happened. Narrator: One of the places where people sought refuge was at Joe and Loraine Fogel's wedding. Strangers ate all the food and drank the champagne. Meanwhile, the groom was stranded for hours at Union Station. Josef Fogel: Finally, the ceremony did get on. We were married by one of the judges in Providence. The ceremony was held early in the evening, by candlelight. Loraine Fogel: Late in the evening. Marilyn Fogel Schlossberg: The judge who married Joe and Loraine, of course, was so anxious to get home because his family had no idea where he was, either. And so we just kind of grouped together and boom, boom, boom, that was the ceremony. Narrator: The Fogels had booked their wedding night at the best hotel in town, the Biltmore, just a few blocks away. But now, once again, they were blocked, this time by the human tide that swept downtown as the waters ebbed. Marilyn Fogel Schlossberg: You know, '38 was not a prosperous time in our lives, and I would imagine that a lot of these people saw an opportunity and grabbed it. Narrator: As night fell, looters moved through the city. They broke into Kay Jewelers, Liggett's, Woolworth's, the J.R. Foster Company, and emptied the shelves. One looter forced his way into the Wood Marine Supply Store, took a rowboat and rowed down the street. Marilyn Fogel Schlossberg: And so I sat up at the window, watching the activity downtown. And every once in a while, you know, you'd see somebody running from one store to another and then the loudspeakers on. And they announced if you weren't, you know, out of town, that they were ready with guns drawn. 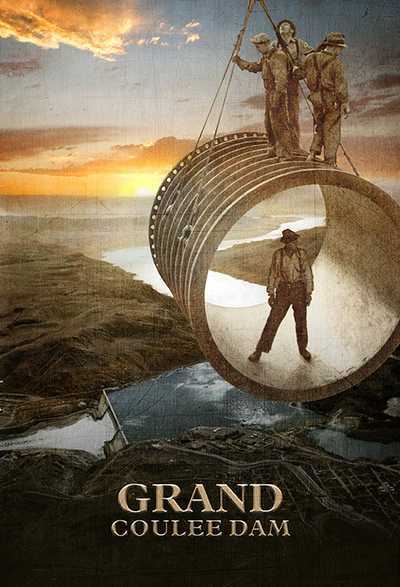 And so in order to protect Joe and Loraine, to get them from the Narragansett to the Biltmore, they had to go by National Guard. Loraine Fogel: We had one fellow in front of us with a bayonet, one fellow in back of us with a bayonet, and we were, you know, just mincing through the city rubble in the streets. Narrator: The great store displays of Weybosset and Dorrance Streets, which before had drawn crowds of windowshoppers, now were plundered. A Rhode Island writer, David de Jong, described what he saw. "They came neck-deep or swimming, holding flashlights dry above them, rising out of the water and disappearing through the demolished store windows. At first, there were few. Then there were hordes assisting each other. They were brazen and insatiable. They took everything. When a few policemen came past in a rowboat, they didn't stop their looting. They knew they outnumbered the police. 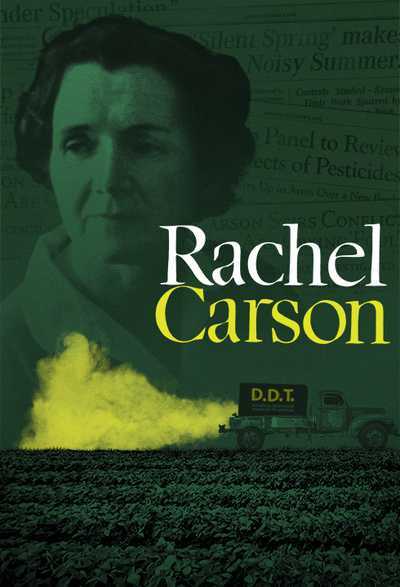 They seemed organized, almost regimented, as if they'd daily drilled and prepared for this event, the like of which hadn't happened in 120 years." Springfield, Massachusetts; Hanover, New Hampshire; Rutland, Vermont -- the hurricane charged across New England before coming to rest at 10 P.M. over Quebec. Electrical fires broke out in New London, Connecticut and Peterborough, New Hampshire. Floods swept Massachusetts. In the end, the storm killed almost 700 people. The National Weather Bureau denied responsibility. Early warnings would not have made a difference, the Bureau explained. New Englanders wouldn't have paid attention. They were not properly hurricane-minded. 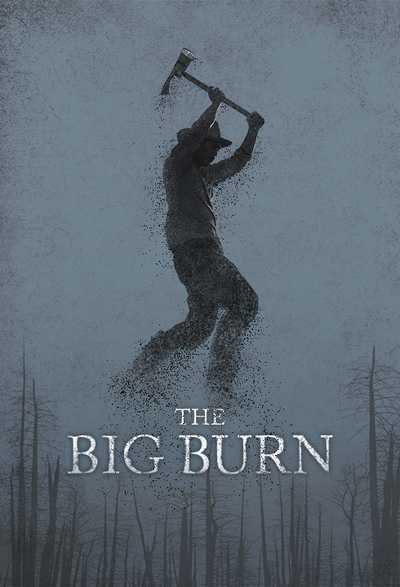 Ed Ecker: The next morning, we see the buildings in the fishing village askew, and when we got back down on the beach to get back to our home, there was dead silence, and it was just a flat calm -- no kind of sound whatsoever, no birds, no seagulls. It was just quiet, very quiet. Narrator: On the morning of September 22nd, the sky was a clean, clear blue. Seas were calm. There was hardly any wind. The storm had left 6,300 people homeless. In Montauk, town supervisor Perry Duryea sent a wire to the Red Cross: "Montauk fishing village practically destroyed. Several lives lost and missing. No water, light or phone connections. Fishing industry wiped out. Immediate aid necessary." Milton Miller: Well, Montauk was completely gone. That was wiped right out, and the whole winter it was a shock to me, you know. I never got straightened out until the following spring. Stuart Bartle: It was just a total mess. Everything was a mess, and people were picking over the wreckage, looking among the wreckage. Patricia Shuttleworth: There was nothing but debris everywhere. In the village, up to where the water had gone, it was very bad. There was very bad debris on all the roads. It looked as if an atomic bomb had gone off. Narrator: On Westhampton's Dune Road, looters picked over the bodies on the beach, rifling handbags, slipping jewelry from fingers before the dead could be reclaimed by their families. Patricia Shuttleworth: The country club was turned into a morgue that evening, and when bodies were brought in, they were laid out on the floor. And, of course, there was no electricity, so people wanting to search for their relatives had to come in with flashlights or candles. And it was a very eerie scene. When just a few weeks before, there had been very happy Labor Day dance going on there, now the dance floor became a morgue. Narrator: The storm had wrought havoc all through New England. Thousands of livestock were killed. Crops were flattened, farmers wiped out. Two hundred and seventy-five million trees were knocked down, including a third of Vermont's sugar maples, half of New Hampshire's white pines. But all this paled compared to Rhode Island -- 380 people dead, most in the beachfront towns. In Westerly, May Lowry's husband came to the rectory of Christ Church to get help. He and the minister's son borrowed a truck from the local garage. Jack Tobin: We drove along the shore road and my friend and companion on this trip, David Lowry, was looking for his wife -- that was Beatrice's mother. And we soon came upon a body which he thought was his wife. I was pretty sure that it wasn't. He tried to give her artificial respiration, but it was long since past where that might have helped. And we searched the area as best we could among the wreckage that was available to us, and we put, oh, five or six bodies in the back of the pickup truck. That seemed to be all we could do at that point. Beatrice Lowry Edmond: The storm was Wednesday, and I think it was Saturday -- either late Friday or Saturday -- before someone found her who recognized her. And just you became one of the rest of the town of Westerly to have to go through waiting your turn to be buried. Jack Tobin: We knew of people who were missing, but many of them weren't found for days and days and days, so that Christ Church became almost a continuous funeral service. There would be a funeral today, there would be two funerals tomorrow, there would be three the next day, there would be two the next day. And this went on for a week or 10 days. Narrator: Westerly's tragedy was a private one. There was no television, no working telephones. 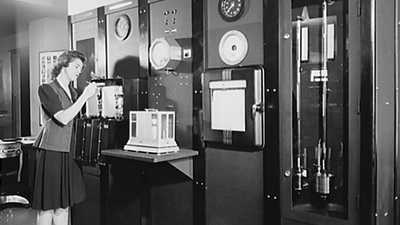 A single ham radio operator was the town's only connection to the outside world. All through New England, electricity was out. People huddled in cars with their radios on, trying to get news. But on the 22nd and the days that followed, it was not the hurricane that dominated the airwaves, but the threat of war in Europe. On the very day of the hurricane, the Czech parliament gave in to the Nazis. Neville Chamberlain would announce that he had secured "peace in our time." The events in Long Island and New England were overwhelmed by those in Munich. 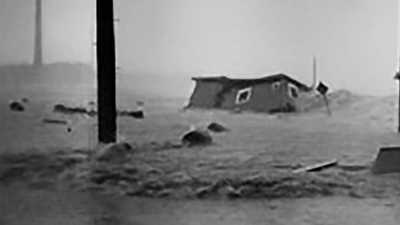 The hurricane of '38 was one of this country's worst natural disasters, but many Americans were hardly aware it had happened. The storm left just as it came -- hidden from public view. Anne Moore: When we came back, I think it would almost have been easier to take if there had been a lot of debris. But it was sand with chunks of our seawall, but there was very little sign that there had ever been houses there at all. Narrator: The local paper reported that Anne Moore's mother had drowned in the hurricane. In fact, the entire Moore family, clutching their piece of bedroom floor, had blown clear across Little Narragansett Bay and landed safely in Connecticut. After the hectic business of denying she was dead, Mrs. Moore sat down and wrote a letter to her brother. "I sometimes feel that we have had a preview of the end of the world. For some, it was the end. It might easily have been we. We experienced every sensation except that of actually leaving this world, but that was not in the pattern of our lives. We who have been through this hurricane, I'm sure, have gained a deeper, more complete outlook on life than we could have ever gained otherwise. Lots of love, Catherine." 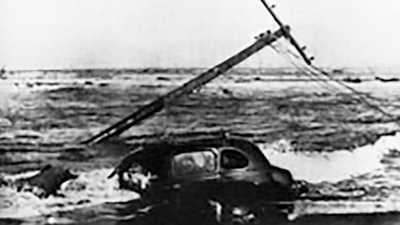 Several families documented the destruction wrought by the Hurricane of '38 with their home movie camera. Before the system of naming hurricanes was initiated during the early 1950s, tropical storms and hurricanes were often named with reference to the year of their occurrence and the area they devastated. 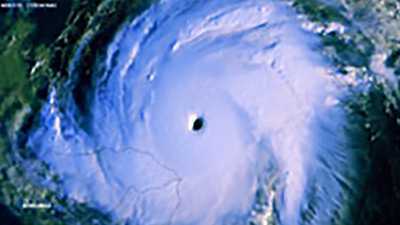 The Great Colonial Hurricane in 1963 to Hurricane Ike's landfall in Galveston, Texas, in 2008. Captain Arthur A. 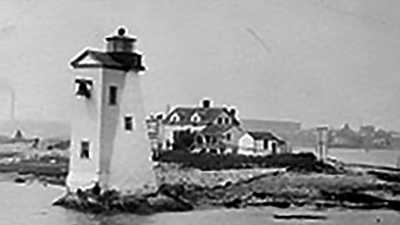 Small had kept the lighthouse on Palmer's Island near New Bedford since 1919. In Chilmark, on the island of Martha's Vineyard, Benedict Thielen and his wife watched as water began to trickle into their summer home. Harrison McDonald was traveling by train from Albany, New York, to Boston, Massachusetts during the 1938 Hurricane. Helen Joy Lee, daughter of the founder of the Packard Motor Car Company, summered at Watch Hill, Rhode Island for a number of years. Florida resident Mrs. Norman was not surprised and sat down to observe what she thought was a peach of a windstorm. Norman Caswell was driving eight students from the Thomas H. Clark Elementary School back to their homes in the afternoon of September 21, 1938 when a surge from the hurricane swept across the spit of land and washed the bus into the water. On September 21, 1938, the headlines in the Boston Evening Transcript read "Czechs in Surrender" and below that: "Raging Floods Sweep N.E. 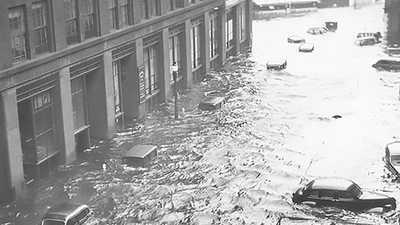 [New England], 11 Dead in 4-Day Rain." The material damage of the storm has been calculated to be $4.7 billion in 2001 dollars. Six hundred and eighty lives were lost in the destruction and rising waters. On November 1, 1870, weather forecasts for the eastern United States were being issued for the first time, although these were just 24 hours ahead. Hurricanes are among earth's most ferocious natural forces. But how do these swirling weather patterns develop? In the years before radar had been invented, no one had ever seen a storm like this.